Numero Lingo is the quick and easy way to learn to count in a variety of foreign languages: English, French, German, Italian, Portuguese, and Spanish. Even when we are fluent in all other aspects of a language, many of us still find it difficult to understand numbers delivered at speed. 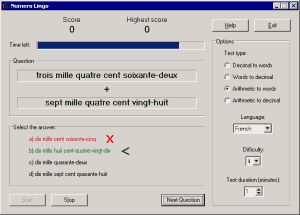 This freeware software tests your ability to quickly translate numbers displayed in the selected language. 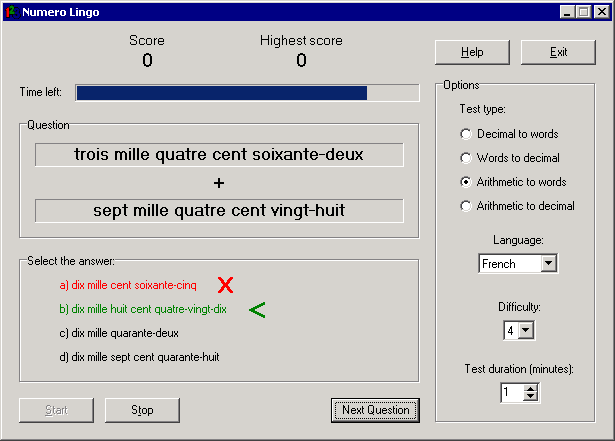 A test lasts for the number of minutes you specify, during which you must answer numerical questions displayed in the chosen language. For example, if you were asked to translate the words "five hundred and sixty one", your correct response would be to type "561".